Photos, music, videos, designs of your entire career's portfolio... we all have some sort of digital library nowadays, especially when it comes to the online aspects of our small businesses. For the photogs and videographers out there, we know that's a given for your respective specialties! But planners, florists, and makeup artists, you all are totally affected, too! So we are super excited to have leading local computer expert, Nathan of No-Nonsense Computer Solutions, here today to share his top tips when it comes to protecting your client and other biz-related data! And after you've read his advice, act like a computer virus and pass it on to a tech-deficient friend so they're not sobbing one night at their computers watching the Blue Screen of Death or the Eternal Rainbow Wheel of Destruction! As a wedding professional, you probably have thousands of these files backed up for your clients and for yourself. But where do your pictures, music, videos, designs, and memories reside? On your computer only? Maybe an old external hard drive in a drawer somewhere? What happens if you lose your computer or that hard drive takes its final breath? Losing all of these important business files and digital memories would devastating. So then, how should we back up our digital business footprints and, just as importantly, our current clients' data, to make sure that a catastrophic failure of computer equipment doesn't destroy your business behind-the-scenes? Well, it's as easy as 3-2-1. While it might sound a little too cheesy, this is actually the golden rule for data storage. Let's walk through each! 3. You should have 3 copies of all your data. That means having a single copy of a file on a USB or hard drive somewhere isn't really sufficient. Again, if that drive dies, your files are lost. The chances of 2 drives failing at once? Very slim. How about 3 failing at once? If that were to happen, you should consider playing the lottery (or staying away from lightning altogether) because it's a bit unlikely. 2. You should have the data on 2 different types of storage. 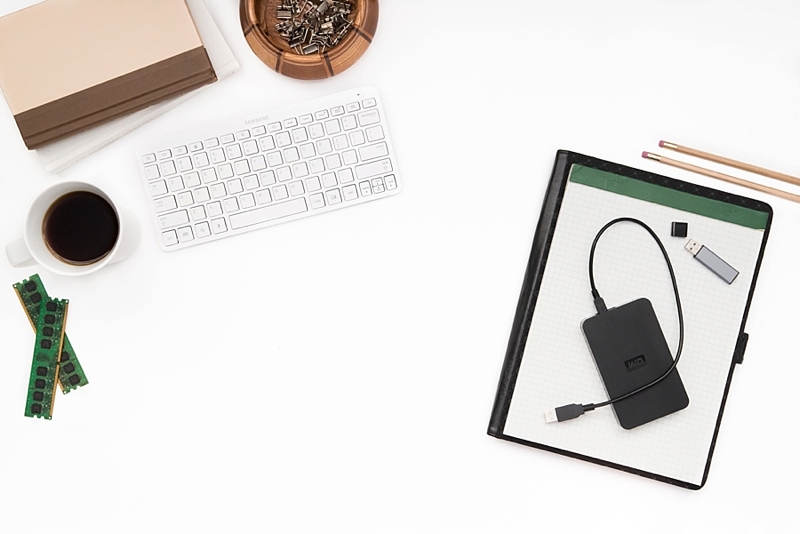 This means don't just keep everything on external hard drives. Consider using an external hard drive AND a USB stick, SD card, or DVD. Now, being reasonable here, this can be a little bit difficult depending on file size, but with a little bit of research, you can find the right storage amount in DVDs or USB thumb drives. With massive amounts of data (especially thinking about you, videographers and photographers! ), it might only be reasonable for you to use multiple hard drives of 4-8 terabytes. 1. You should have a copy of your data offsite. Offsite means not physically in your office or home. This could be done through something like Dropbox or Google Drive, or you could try something automated like CrashPlan or Carbonite. It is strongly recommended that you store your data somewhere offsite in the event that nightmares happen like your house going up in flames or is robbed of all your electronic equipment. Are you a photographer who has promised to retain images for 2 years as a part of your contract? Or a wedding planner who needs archives of all your past weddings? Or a small business owner whose business heavily relies on archives or active digital content? Implement 3-2-1. So many options are out there, so how do you decide which service you should use for offsite backup? As mentioned above, two that I recommend are CrashPlan and Carbonite. CrashPlan is a backup service that runs in the background on your computer. Whenever you place files on your computer, they are immediately placed into a queue to be backed up to the cloud. Carbonite is similar as it backs up your entire computer and ensures that files are also intact whenever you need to retrieve them from the cloud. Pricing varies for each service, but are comparable depending on the option you choose. Which is better? That's like asking if apples or oranges taste better. It's a personal preference that has to work for you. Do some research and see which application would best fit your budget and tech needs. At the end of the day, you have to have full confidence that you will have access to important documents and images that link your business workflow to your future business aspirations. Photo by CGP Stock. Nathan of No-Nonsense Computer Solutions offers technical support and services for small business and everyday users in the Hampton Roads area. From custom computer builds to Mac support to data recovery, iPhones, and more, he has tech solutions to give you freedom to be creative - no matter what device you choose!